I’ll admit that I had my doubts about this recipe. I wasn’t sure how a cake mostly comprised of yogurt and eggs, with almost no flour at all, could possibly work. In retrospect I shouldn’t have worried. After all, cheesecake has cream cheese and sour cream as its primary ingredients. And that’s exactly what this ended up tasting like… a very light cheesecake. Nothing like those heavy New York style cheesecakes- the air that’s whipped into the eggs keep this from being too dense. I should warn you that the amount of lemon rind and juice make this quite lemony. If you’d like a more neutral flavored cake I’d recommend dialing the lemon juice way back. Although it is perfectly good served alone, it’s best with a dollop of yogurt and some berries on top. Preheat oven to 350 degrees and thoroughly grease a 9-inch square pan. Beat the egg yolks with about two-thirds of the sugar (just eyeball this… no need to measure) until light and fluffy. Stir in the vanilla seeds, yogurt, lemon rind, lemon juice, and rice flour. In a separate bowl, whisk the egg whites until firm, and then gradually add the rest of the sugar. Whisk until the egg whites form soft peaks. Add a small amount of the whipped egg whites to the yogurt and egg yolks mixture and stir well to lighten. Then fold the rest of the egg whites in carefully but thoroughly. Pour into the prepared pan. Place the pan in a roasting pan and pour water halfway up the outside of the baking pan. 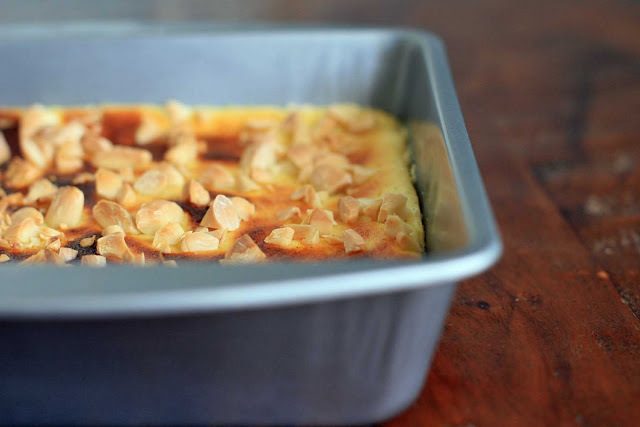 Bake for 20 minutes and then sprinkle with the chopped almonds. Return to oven and continue cooking until the top begins to turn golden, another 20-25 minutes. 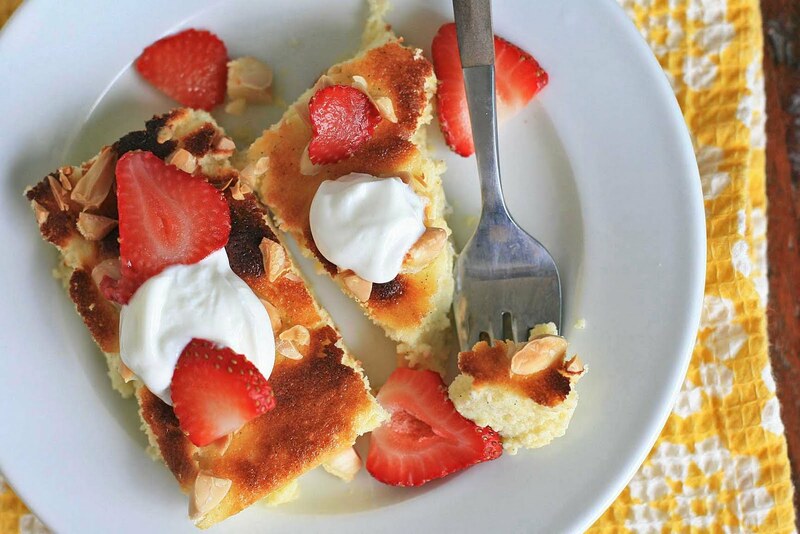 Let cool to room temperature and serve with a dollop of Greek yogurt and some sliced strawberries.